As soon as my son was born – I began to think about his future. The world is very competitive and excelling in your chosen field is a must. So, whether my son decides to become the next Einstein or the next Sachin Tendulkar- he would need to utilize his brain as well physical abilities to do so. 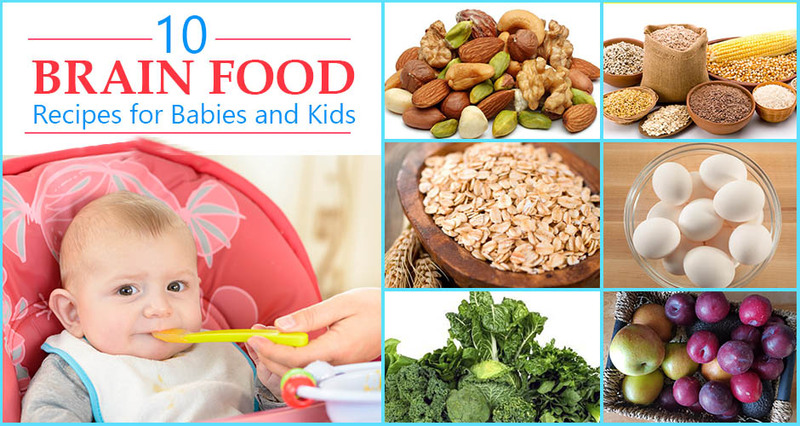 There are certain Brain Foods that can help to boost a child’s brain development, plus improve brain functioning, cognitive skills, memory and concentration. But our child will always prefer taste over nutrition which is something I’m sure every mom has faced! Combine yogurt and fruit in a blender until smooth. Empty the mixture into plastic bag. Snip a small hole in the bottom corner of the bag. Squeeze small button sized mixture from hole onto a tray lined with baking paper. Freeze for 4 to 5 hours and serve. Peel the skin off the apple and cut it into thin slices. Now blend these slices with milk, sugar and vanilla essence in a blender. Heat butter, garlic powder, onion powder and pepper in a saucepan over medium heat. Stir green beans into butter mixture and cook until beans are cooked 5 to 10 minutes. Add salt and cook for a minute more. Add these beans as salad toppers or use in veg rolls. Grease a square baking pan with butter and keep aside. Dry roast the oats and nuts in a pan for 8-10 minutes on stove until lightly toasted and keep aside in a large bowl. Meanwhile add honey, butter and brown sugar to a small saucepan and cook until the butter melts and the sugar dissolves. When butter mixture is ready, remove from the heat and add vanilla and salt. Now pour this mixture over the oats and nuts and mix well, making sure none of the oats are dry. Place all of the oat mixture in the prepared pan and press down using a spatula. Chill this for 2 to 3 hours. Cut into squares and lift out. This recipe is exhaustive – Watch this video to learn how to make homemade cerelac powder. In a saucepan, boil water and cook the oats in it. In a pressure cooker, steam the apples. In a blender, puree the apples after they are cooked. Mix the cooked oats and the pureed apples. Add the breast milk or cow’s milk to get the consistency that you need. Beat an egg with a few tbsps of milk or formula. Add spices like oregano or cumin. In a pan, this mixture in oil. Cook it on low flame and keep stirring till done. Keep small pieces of fish and carrots along with salt and spices in a bowl and steam it in a pan full of water. You can also pressure cook for 2 whistles. Steam the fish for 10-15 minutes, till there is no pink flesh visible. Now blend together carrots and fish using a mixer or stick blender. Add a little water if required for consistency and serve hot. Cut and boil all vegetables like french beans, cauliflower, carrots, a small piece of beetroot. Mash the chopped veggies along with the potatoes. Dip a slice of bread in water and squeeze out the water. In a mixie, puree the blackberries, water and lemon juice. Strain this mixture and keep. Return this strained puree to mixie and add sugar, vanilla and blend again. In a bowl, combine yogurt and blended puree. Now you can serve this chilled in a cup or even freeze for 2-4 hours before serving. Freezing it will make it look more like an ice cream. What recipes do you use to serve nutritious and healthy brain foods to your child? Share below!